techless This seller consistently earns high ratings from buyers, thanks to fast shipping and excellent service. 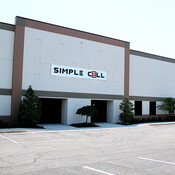 We are Simple Cell, a family owned business established in 2008, located in Baltimore, MD. We are an affordable online seller of Cell Phone's, Cellular accessories, and various electronics. Our items are purchased in bulk from National Retailers to provide the lowest online prices for our customers. All orders placed are shipped out within 24 hours of receipt during normal business hours. Our Customer Experience Support Team is available Monday-Friday 8:30 AM to 4:30 PM EST for any inquires.